© Jeremy D'Entremont. Do not reproduce without permission of the author. The quiet waters behind Fayerweather Island invited ships to safe anchorage... Captains of commerce made their homes in this neighborhood. Fishermen, warriors, mariners, pleasure-seekers, builders and maritime industry have shared the life of the Port. - Dr. Ivan O. Justinius, History of Black Rock, 1955. _Black Rock Harbor is a deep, protected harbor that developed as a trade port and shipbuilding center in the 1700s. The village of Black Rock was once part of Fairfield, but now is a neighborhood of the city of Bridgeport. Black Rock Harbor is sheltered by Fayerweather Island, which made the island an ideal place for a lighthouse to mark the harbor entrance. Seven-acre Fayerweather Island, attached to the mainland by a breakwater since 1917, at one time was a much larger island used mainly for the pasturing of sheep. In 1807, the federal government purchased 9 1/2 acres on the island from Daniel Fayerweather for $200, and $5000 was appropriated for the new light station. The following year the first Fayerweather Island Lighthouse, an octagonal wooden tower, was built on the south end of the island. The first keeper, John Maltbie of Fairfield, died after five months at the station. The 40-foot octagonal tower was destroyed in an 1821 hurricane, and a new tower was completed two years later. The builder of the second Fayerweather Island Lighthouse proclaimed in a local newspaper that the tower was "built to withstand the storm of ages." In his American Coast Pilot, Edmund Blunt voiced another opinion: "A more contemptible Lighthouse does not disgrace Long Island Sound, most shamefully erected and badly kept. "The most remarkable personality in the long history of Fayerweather Island Light was Kate Moore. Sometimes there were more than two hundred sailing vessels in here at night, and some nights there were as many as three or four wrecks, so you may judge how essential it was that they should see our light. _It was a miserable one to keep going, too -- nothing like those in use nowadays. It consisted of eight oil lamps which took four gallons of oil each night... During windy nights it was impossible to keep them burning at all, and I had to stay there all night, but on other nights I slept at home, dressed in a suit of boys' clothes, my lighted lantern hanging at my headboard and my face turned so that I could see shining on the wall the light from the tower and know if anything happened to it. Our house was forty rods [about 700 feet] from the lighthouse, and to reach it I had to walk across tow planks under which on stormy nights were four feet of water, and it was not too easy to stay on those slippery, wet boards with the wind whirling and the spray blinding me. Keeper Stephen Moore had become disabled after an accident and Kate took over full duties at the lighthouse as a young woman. Her father remained official keeper until he died in 1871. _An 1850 inspection reported "everything now pertaining to the light is first-rate." A new lantern was installed and the old lamps were replaced by a fifth order Fresnel lens in the mid-1850s. Over the years Kate Moore maintained a garden and cared for a number of animals, including a flock of sheep. She also carved and sold duck decoys and had a thriving oyster business. When an outsider trespassed on her oyster beds, Moore would grab her shotgun and tell them, "I represent the United States Government and you've got to go." You see, I had done all this for so many years, and I knew no other life, so I was sort of fitted for it. I never had much of a childhood, as other children have it. That is, I never knew playmates. Mine were the chickens, ducks and lambs and my two Newfoundland dogs. Kate Moore was credited with 21 lives saved during her 62 years at Fayerweather Island. There were frequently vessels wrecked nearby in storms, and many times Kate and her father managed to pull survivors to safety in the keeper's house. The shipwrecked men were given food and shelter, but according to Kate Moore, "The government never paid us a cent for boarding them." She said that the worst part of the job was recovering the bodies of those who died in wrecks. After her father's death, Kate Moore was officially appointed keeper. She remained at the station for seven more years, resigning in 1878. The house that Kate Moore and her father had lived in for many years was described as a "dilapidated old edifice" and was replaced by a new wood frame house in 1879. Moore spent her last years in a cottage across from the Fayerweather Yacht Club, with a view of Fayerweather Island and Long Island Sound. Right: The keeper's house stood from 1879 until 1977 when it burned down. When asked if she missed her island home, she replied, "Never. The sea is a treacherous friend." _Leonard Clark, a Civil War veteran and former whaling captain, was keeper for 28 years. He and his wife raised three children on the island, and one of their sons became keeper of New York's Execution Rocks Lighthouse. In 1906, Mary Elizabeth Clark became keeper following her husband's death. Two months later she was succeeded by John D. Davis, a veteran of the Irish Lighthouse Service. Left: Kate Moore lived in this house after leaving the lighthouse. It was torn down in 1930. Davis remained keeper until 1932, when the lighthouse was discontinued. Fayerweather Island is home to egrets and other wildlife. It was replaced by two automatic offshore lights, and Davis was transferred to Dutch Island Light in Rhode Island's Narragansett Bay. After its decommissioning, Fayerweather Island Light was given to the City of Bridgeport and became part of Seaside Park, a recreation area established in the nineteenth century largely through the efforts of P. T. Barnum. The keeper's house was occupied by squatters for several decades. Peter Klein, a Bridgeport native, lived in the house off and on for about 25 years. His dogs and cats chased birds along the beach, and Klein built several sheds and chopped wood for heat. Klein was sleeping in the house during the night of December 12, 1977, when he woke up to the smell of smoke. He saw flames reaching up the stairway to the second floor, and quickly escaped out a window and slid down a drainpipe to safety. The 1879 house was completely destroyed, and Klein lost a dog and cat in the fire. Another dog was rescued by firefighters. ​Luckily, the exterior of the lighthouse was not seriously damaged and the tower remained structurally sound. The historic structure soon fell prey to vandals, who gutted the interior. In 1983, the Friends of Seaside Park and the Black Rock Community Council mounted a preservation effort. _They replaced glass and secured the door and windows. The Friends of Seaside Park also cleaned Fayerweather Island of debris, planted trees and other greenery, and established the island as a nature preserve. Unfortunately, the lighthouse and island again became sad victims of neglect and vandalism. The door was forced open, and the interior of the lighthouse appeared to be a favorite spot for beer drinking parties. The future of the historic site looked bleak. New hope arrived with a preservation effort initiated by two local residents. The lighthouse has been a target of graffiti "artists"
_Black Rock artist David Grant Grimshaw and caterer Patricia Roche often wondered what could be done to save the lighthouse. 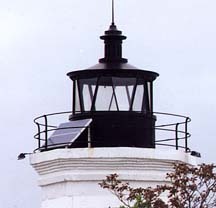 As a result of their concern, a lighthouse fund was established and began raising money in 1993. A Preservation Ball was initiated in 1994 by Grimshaw and became an annual event. Local artists like Grimshaw and Mary Chandler donated paintings to help raise funds. The group, in association with the Black Rock Community Council, raised $25,000 in cash and in-kind services, and the City of Bridgeport's Board of Park Commissioners matched the amount by granting $25,000. The Black Rock Seaport Foundation, affiliated with the Black Rock Community Council, oversaw the 1998 restoration. Under the direction of architect and Black Rock resident David Barbour, work on the lighthouse proceeded in earnest in the spring and summer of 1998. Barbour and landscape architect Stuart Sachs provided in-kind services, and the contractor was American Building Group of Bridgeport. Work was delayed for a few months while paint and mortar were analyzed so that the original mortar and paint color could be matched. _ By the end of the year the masonry was repaired, a coat of graffiti-resistant paint was applied, the lantern room was reglazed, rust on the railings was removed, and new doors and windows were installed. The new windows have vandal-proof steel panes, which from a distance have the appearance of glass. A protective stone seawall was also reconstructed, affording better protection for the foundation of the lighthouse. Left: Some of the people responsible for the restoration of Fayerweather Island Light. L to R: Patricia Roche, Mary Chandler, Steve Tyliszczak, David Barbour. The renovation was complete, except for one thing -- the group felt the landmark should be visible at night. Two power companies, United Illuminating and Bridgeport Energy, stepped in to help. The companies donated solar panels and lighting equipment. Workers and materials were transported to the island by Captain's Cove Seaport and the Fayerweather Yacht Club, and the panels were installed in the top of the lighthouse away from public view. The lights illuminate the tower but are not meant to serve as a navigational aid. According to an article in the Connecticut Post, the lighthouse had been temporarily -- and mysteriously -- relighted in April of 1996. _David Grant Grimshaw arrived at the Black Rock Yacht Club on the evening of the Preservation Ball and couldn't believe his eyes. "Across the harbor was the eerie glow of the lighthouse against the black sky," he said. "Everyone thought I had arranged the illumination, but I hadn't." Attempts to find the phantom "keeper" were unsuccessful -- maybe the spirit of Kate Moore had grown tired of waiting for the restoration. All involved are pleased with the fruits of their preservation efforts. "It was a real challenge. It does prove that people can make a difference," says Patricia Roche. Right: Solar panels provide power to illuminate the lighthouse. There was a temporary setback in 2004 when vandals smashed the solar panels on the tower. New panels with protective cages were in place by early 2007. Left: Instead of glass, the windows now have steel panes. The lighthouse and the land around it took a major hit in Hurricane Sandy in October 2012. In September 2015, it was announced that $439,000 in federal funding had been approved, a Disaster Relief Assistance Grant administered through the Connecticut State Historic Preservation Office. The funds will pay for rock armoring on the shore that will protect the lighthouse, as well as a new steel door on the lighthouse. The work is expected to begin in 2016. John Maltbie (1808-1809, died in service); Charles Isaac Judson (1809-1814, died in service); Daniel Willson (Wilson) (1814-1817? ); Stephen Moore (1817-1871); Catherine (Kate) Moore (1871-1878); Leonard Clark (1878-1906); Mary Elizabeth Clark (1906); John D. Davis (1906-1932); Charles H. Gilmore (caretaker?, 1933?-1952).